What if You Really Are an Artist? Artist or Creative was never a skill I would have claimed. I didn’t see any artistic potential in my bag of tricks. I could appreciate the skill and talent in others and I loved to be a patron. At a young age, we are classified and labeled: athletic, artistic, musical, intellectual, etc. It’s funny that we watch movies where the characters are assigned to roles or jobs and we are horrified at the lack of choice or freedom. But are we really all that far from it in our society? But that is a topic for another post perhaps. My point here is that I am an artist where I never was before. In September of 2012 a man walked into the store I owned with a couple of black plastic cases. He opened them and angels sang inside my head. It was full of this amazing body of work, all in glass: Pendants, rings, ornaments, wine toppers, earrings, jars. I was in love. He left the cases with me overnight and I spent a few more hours than I have ever admitted to him studying the pieces trying to figure out how he did what he did to create those things. I ended up buying much of what he showed me at wholesale prices he gave me. He shared that he wasn’t actively working at the moment, but looking for studio space. I immediately wanted to set him up in my office so he could make more of this stuff. I had the urge to get more of this into the world. A few months I connected once more with this man over the mutual experience of failed marriages, being veterans of the military, single parents and so much more. We forged a deep friendship and he began to share this world of glass art with me and all the forms it could take: functional, jewelry, sculptural and whatever one might like. I would fantasize about watching him work on the torch and see the pieces emerge from the fire and his imagination into reality and we’d talk about the ideal studio. It was not surprising to me that our visions were similar. In late 2013 he found a corner of a space to set up his torch and begin to work again. He set up a small torch next to it and issued the transformative invitation. I laid my first rod to fire. I was absolutely hooked. To say I loved the experience would be selling it short. It was soul fulfilling. And even that feels insufficient. Six months later found me in a position to invest some money and I bought my first big girl torch and all the accessories that I could. I got my own bench in the studio that we had since taken over. I found my life as a life coach expanding to include a life as an artist. We took ceramics classes and open studio time to work the medium on the vertical plane and I saw the application on the horizontal. 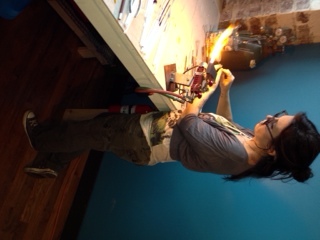 I learned how glass responds to different flames and I fell more deeply in love. I realized that I am an artist now and it surprises me. But I am and I love it. I love this part of me and I love that I get to work as an artist. I am comfortable with the energy of being an artist and exploring and not getting attached, but creating so that people like me might be able to see it, connect with it and have a spiritual response to it. And maybe that spiritual experience will awaken their artist within. Your assignment: take an art class, buy a sketchbook, grab a coloring book and simply create at least one time this week. Let your inner artist energy play a little bit! March 30, 2015 nolimitsjenn	authenticity, create lifestyle, who am i?